Are truth and fiction really that different? Or, more to the point, does the difference between them really matter? Life of Pi by Yann Martel suggests that no, in many instances, particularly those relating to faith, the difference between truth and fiction just isn’t that important. Stories can be preferable to truth, as they are often more beautiful. Why shouldn’t we choose to believe in them? That’s a nice sentiment, but there’s just one problem: the vehicle through which it’s delivered can’t really stand up with the load it’s carrying. 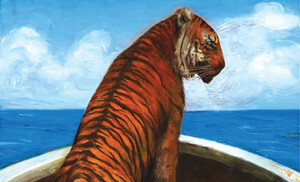 Life of Pi is a good story with some really interesting themes, but its pace is so glacial that by the time readers have the opportunity to piece those themes together, they may have checked out. Even the illustrated edition’s sloth isn’t that cute. 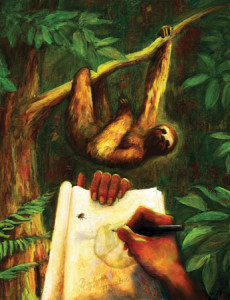 The novel opens with a frame story of an unnamed author traveling through India and hearing about a true story that will “make you believe in God.” That’s a tall order, one that’s made even harder to reach by the fact that right after the introduction ends on that promise, we’re subjected to a narrative about sloths. That’s right, sloths. Don’t get me wrong: I think they’re super cute, but the book doesn’t provide pictures, and it’s also just promised me a spiritual experience. Instead, it regales me with lists of facts like how long it takes a sloth to climb down a tree. I’m not exactly about to fall to my knees in prayer, here. The first third of the novel is us learning about Pi, before and after his ordeal, from the stories he tells of his time growing up in Pondicherry (a former French colony in India), and of his collegiate studies in zoology and religion at the University of Toronto. These are interspersed with notes from the author about a middle-aged Pi’s life as the author interviews him in the present. “This is a story with a happy ending,” we’re assured, as Pi cuddles his young daughter, bracing us for the terrible events that are to come. What comes is the sinking of a giant metal freight ship, with its entire crew, officers, and Pi’s family aboard. Also aboard are many of the inhabitants of the zoo Pi’s father used to run. Another survivor, Richard Parker, is one of these. He’s full-grown Bengal tiger, named for the hunter who found him as a baby in the wild. Don’t mistake Life of Pi for a Disney-fied story about an unlikely bond between a boy and a beast (I still blame Aladdin for making me want a pet tiger). Richard Parker may give Pi a purpose to live, daily tasks that he must accomplish (a tiger of that size takes quite a lot of feeding if one doesn’t want to become the meal), a sort of companionship for him to anthropomorphize in his most desperate moments, but never once is the danger he represents understated. Pi is only able to survive because he is smart, and because both he and Richard Parker were raised in a zoo. The middle of the novel is a study in human spirit and experience. A variety of factors keep Pi alive: the ingenuity and invention that come to all who are pushed to the brink, the unique experiences Pi’s had in the course of his 16 years of life, and sometimes, pure luck. This is the part where I go, “you’re a kitty!” and am promptly eaten by a tiger. Pi’s faith also keeps him sane. He’s always been drawn to religion: by an early age, and to the horror of his community and skepticism of his parents, he’s a practicing Hindu, Christian, and Muslim. Much of his time on the boat is spent in prayer (the time that is not spent fishing or to other life-saving pursuits), and Pi certainly thinks that his survival is due to a higher power. Pi asserts that having something to believe in helped him to survive. Once he’s rescued, he says as much to the authorities who question him about his ordeal. They don’t buy his story, so he crafts them another, one easier for them to accept. Then he poses a question: which is the better story? If we can’t prove the truth of one over the other, why would we choose the one that is less exciting or beautiful? That’s an interesting perspective on faith, though I imagine it’s one that would be unappealing to many. It’s also the most likely fulfillment of the introduction’s promise: this story will make you believe in God, because it posits that a life spent doing so is full of better stories. Present all the debate-worthy philosophical questions you want, book, but a lot of your impact is lost on me because it took so long to get to them. Both the premise (revealed on the book jacket cover) and the attempted fulfillment of the introduction’s promise are too long in coming. The Tsimtsum doesn’t sink until nearly 100 pages in, and the shoe doesn’t drop about the belief in God until the final pages. I wanted to like Life of Pi, but while reading I felt like I was waiting more than doing anything else. Maybe I never gave the book a proper chance. Maybe I should have put any other thoughts (including all the cool images from the film adaptation’s teaser trailer) out of my head and just taken each part of the story as it came. Because I kept waiting for the shipwreck and the adventures I knew would follow, I didn’t have much patience for Pi’s life story at the beginning. I think I would have found all of that more interesting (because it was, especially the parts about him growing up in a zoo, which I would have loved as a kid even more than growing up at Disney World) if I didn’t have any expectations about what the book was about. 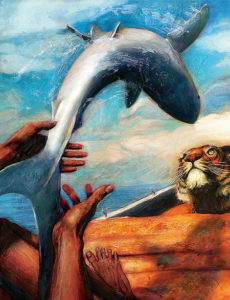 Official illustrations from the Life of Pi illustrated edition, by Tomislav Torjanac. I just keep returning to the promise made by the book’s introduction. If my expectations were too high, or if I kept waiting for something that wasn’t going to happen (or took too long to do so), then the blame rests at least in part with a story that at its beginning more or less tells me to raise them to the heavens. I don’t know if I would ever love Life of Pi, even if it’s an enjoyable enough read. If you’re approaching it because of the movie (like I did; I first learned about the novel thanks to the film trailer), then try to put the film out of your mind as much as possible. Or just don’t bother with the book at all, because at times it felt a bit tedious. Squeamish readers should take caution; telling me Pi had to resort to some cannibalism and tiger crap-eating was enough, book, I really didn’t need details. Even so, readers more patient than me will find elements to relish. A 16-year-old boy believably survives for over 200 days in a lifeboat with a tiger. Novel concepts on faith are explored. If either of these is appealing, give Life of Pi a try. Find Life of Pi on Amazon.